I love Scottish heroes. They maybe a little rough around the edges, but they fight for what they believe in...and that usually involves the heroine. 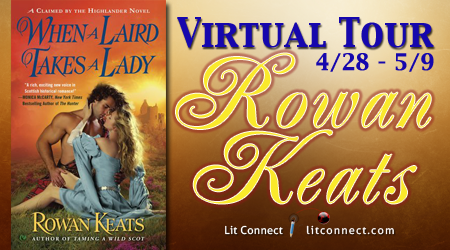 Any Scottish warrior is worthy of a sigh, but a Scottish laird—especially a medieval one—can truly make your heart pound. What makes a Scottish laird so interesting? Her entourage took one look at his face and scattered into the night. The tremble in her voice registered, and he bit back the snarled response that leapt to his lips. He had no idea what expression lay on his face, but clearly it frightened her. Mindful of his brother's advice, he attempted to soften his features. Her gaze darted away, and he had the distinct impression his efforts hadn’t entirely been successful. Still, she persevered. “Guidance that is typically given by the lady of the keep." "My mother is grieving. Her attention is justly scattered." He frowned. “My people have served the clan for many a year. They know their tasks." The note of disapproval in her voice did not sit well. “We are surviving,” he said coldly. Aiden crossed his arms over his chest. Her words were an echo of his own concerns. And the conversation he'd just had with his men had only heightened those concerns: food was becoming a problem. According to Udard, the reason the hunting party had been captured by MacPherson was that they were venturing farther north in search of game. The forest around the hill fort had been hunted out. Still, Aiden wasn’t willing to cede the point. Not to Lady Isabail. "My household is none of your concern." She took a hasty step back, a rapid pulse fluttering in her long, elegant neck. A very obvious sign of fear, which twisted his guts. She believed he would harm her. Good sense told him to back away, to let her run. But he did not. Instead, he gave into impulse and closed the gap between them to mere inches. Her eyes widened, and one trembling hand flew to her throat. Aiden grasped that hand in his. It was cool and delightfully soft-skinned. The temptation to press a kiss to her knuckles came and went as he stared into her eyes. This was not the time for such an indulgence. He placed her hand on his chest, just above his heart. "Know this. Never, no matter how angry my words or how furious my stance, will I do harm to a woman," he said. "If ever you need to know that you are safe in my presence, simply place your hand here and push. You have my word that I will back away." He let his hand drop. Hers remained on his chest. With their gazes locked, he pressed lightly forward, encouraging her to test his vow. And she did. She pushed. Hello Rowan! Which of the characters in this book were you most excited to write about? So sorry I'm late responding...I got an error message trying to find your blog. I really enjoyed writing Isabail's character. Aiden is wonderful and I really love my hot Highland heroes, but getting inside Isabail's head and understanding her past really brought this story to life.